aka Artsieladie/Sharon Donnelly, unless otherwise specified. 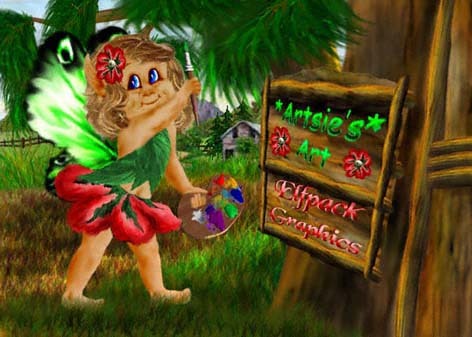 This wiki-page, *Artsie's* Graphics, and all of its sub-pages, associated with Artsieladie, showcase my older graphics. - My art/graphics have greatly improved from both having more experience. - I now use the PNG format, which is a better quality format than especially GIFs, but also JPGs. "created by/copyrighted to" doesn't seem to be sufficient enough for some who make it a habit to steal other people's works. text leaves you with NO excuse for violating my copyright. FYI: "I" have never placed ANY of my works in 'public domain'!!! - Any and all graphics I post on this site are NOT for non-members to use for ANY reason without MY PERMISSION! other collections on ANY other website, period! NO EXCEPTIONS! Elfpack houses and on wiki-pages! - Plain text only emails. NO generic/hyper-links or url shorteners; NO attachments. Non-compliance = spam = deleted. - To ALL art thieves: you WILL be reported, "BLACKLISTED" and made viral throughout Social Media. for denying me access to my works, both art and written works! But I have decided to move to Elfpack what I can. since banned from Elftown as well), which I have lots of data that supports this as well! my Elftown house, he concocted a malicious fabrication to smear my name all across the Internet.